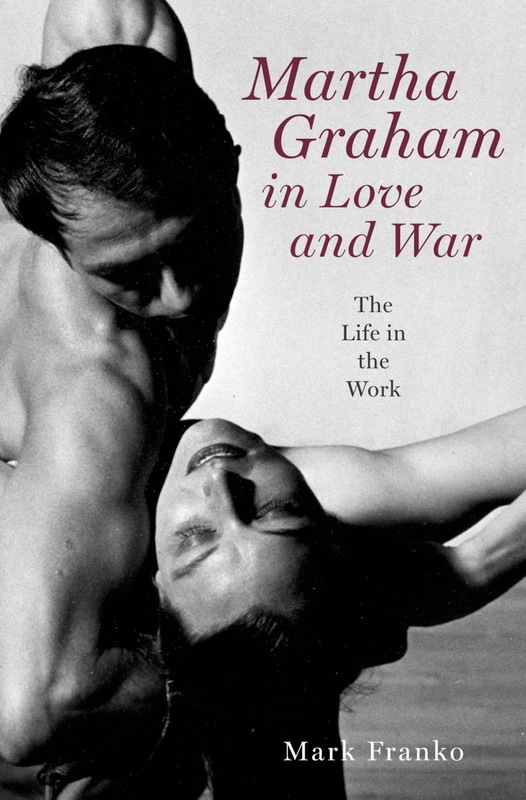 MarkFranko, Martha Graham in Love and War – The Life in the Work (New York: Oxford University Press, 2012). Mark Franko’s book-length study on Martha Graham is a much awaited and very welcome work. As he notes in the Introduction, Graham is often compared to Picasso or Freud, but biographers, whose studies have been fundamental to frame her life and achievements, “have not always given her work the quality or quantity of analysis that has been devoted to Freud, Einstein, Picasso, Stravinsky, Eliot, or Gandhi”. That is why Franko’s intention is to focus on her most productive years, namely those between 1938 and 1953, with a specific attention to what was happening in her life and, more precisely, in her relationship with Erick Hawkins off and onstage. As he says, “it is appropriate and indeed necessary to bring biography into relation with the analysis of production work”. In particular, he chooses four dance pieces, American Document (1938), Appalachian Spring (1944), Night Journey (1947), and Voyage (1953), to investigate the relationship between Graham's life and work. The first and last are quite unknown to the audience, while the second and third represent two of her most popular pieces. He devotes to each of them a chapter filled with impressive analyses fuelled by research that includes the consultation of unpublished material. Franko’s research unveils fundamental aspects of Appalachian Spring which is stripped of its joyful rhetoric. Appalachian Spring is about a newly married couple who is welcomed by the community into their new house. It is the last piece Graham created on North American themes. Analysing material on the creation of the work, Franko discovers that its original conception included other characters, like the Indian Girl and the Fugitive. Throughout the working of the piece, they were eliminated, but, in a way, their ghostly presence remained in the piece. That is why the work is characterised by what he terms “character compression”, in that each character is also the result of the elimination of these characters who possibly survive in another character's movement quality or step or even in Aaron Copland’s musical score. Another significant result of Franko’s research is his analysis of Night Journey and Voyage in connection with the Graham-Hawkins relationship and, more precisely, with their separation. The first is one of her signature pieces and retells the Greek tragedy of Oedipus from Jocasta’s perspective, while the second is one of her most unknown pieces, perhaps her most neglected one, and is about “the effort to shed delusions”. Graham interprets the role of a middle-aged woman who relates herself to three different men. In this sense, she turns away from myth, which had been a kind of creative shield for her since the mid-1940s and presents herself as a more vulnerable artist. That is why, according to Franko, this work was not appreciated by the critics who were instead used to Graham’s magnetic power onstage. As I said, Franko does a marvellous job in putting the two pieces in relation to each other. Graham was writing the libretto for Night Journey when Hawkins left her for the first time for about a year and this event “had to influence Graham’s vision of Jocasta in relation to Oedipus”. Hawkins then definitely left her in 1950 during their European tour which was cancelled due to Graham’s knee injury. Voyage represents a creative elaboration of their separation. Franko notes that “if Night Journey was an anticipatory ritual of separation, Voyage was a post-ritual of becoming separate”. In particular, Voyage “is unique in the annals of twentieth-century choreography because it was conceived in analysis, and developed in a correspondence (and probably also in conversation) with the choreograher’s analyst,” Jungian psychotherapist Frances Wickes. Because Franko does not provide a thorough introduction to either Graham or her pieces, his study may not be of easy access to those who are not familiar with her work. However, the scope of his analysis and the richness of his findings, make it a must read for anyone interested in dance, cultural, and biographical studies as well as the creative process of a remarkable artist. I would like to thank the Oxford University Press for letting me have an advance reading copy of the book before its actual publication. This is a blog about dance history and my research projects, with particular attention to Martha Graham's Letter to the World.